“Over the last decade in the United States, there has been a substantial and significant rise in patients hospitalized for stroke with coexisting HIV infection” — Ovbiagele and Nath, “Increasing incidence of ischemic stroke in patients with HIV infection”, Neurology, 76 (2011) 444-50 (published on-line ahead of print, 19 January 2011). Among the general population, the rate of strokes declined whereas among “HIV-positives” it increased. (The red dotted lines were inserted by me to emphasize the opposing trends, otherwise as in the original article). The increase among “HIV-positives” was only in ischemic strokes, those caused by blockages in arteries; there was no change in incidence of hemorrhagic strokes, those caused by bleeding from ruptured blood vessels. 1. The HIV-negatives include all types of strokes, and their frequency rises sharply with age, being quite rare at ages below the 60s. 2. The HIV-positives include only ischemic strokes, experienced by people in their 40s who would not normally be at significant risk of stroke. Their strokes are brought on by HAART. The data are for 1997 to 2006 “from the Nationwide Inpatient Sample (NIS), . . . which approximates a stratified 20% sample of all non-Federal, short-term, general, and specialty hospitals serving adults in the United States” — thus as comprehensive and representative as one could wish. The changes in incidence were said to be significant at the p <0.0001 level. 1. Among “HIV-positive” patients, HAART increased risk of stroke by a factor of 10.5; “CART should be considered a strong, independent predictor for the development of subclinical atherosclerosis in HIV-infected patients, regardless of known major cardiovascular risk factors” — Jericó et al., Stroke, 37 (2006) 812-817. This is even cited in Ovbiagele and Nath, who do not suggest that it might be inaccurate. 2. “The median age for stroke in this population [HIV-positive] was the fifth decade, which is much lower than that of the non-HIV-infected population”. Ovbiagele and Nath try rather desperately to find reasons other than HAART (which they refer to as “combination antiretroviral therapy”) for the increased incidence of ischemic strokes. For example, they suggest it might be because ARV is keeping people alive longer so that they experience adverse events that are found at advanced ages. But their own statement cited above already disproves that suggestion. In any case, it is not true that people with AIDS are dying at later ages than before the introduction of HAART. The median age for everything to do with HIV and with AIDS — first positive test, first AIDS diagnosis, death — has increased almost linearly from the early 1980s on, plausibly owing to re-definitions and to the increased testing of increasingly healthy populations, and there is no discontinuity in median age of death following introduction of HAART — World AIDS Day: Black Stars and “life-saving” HAART, 2010/12/01; Italy: Demographics of HIV and AIDS, 2010/01/02; Deaths from “HIV disease”: Why has the median age drifted upwards?, 18 February 2009. 3. “Factors independently associated with higher odds of comorbid HIV diagnosis were Medicaid insurance, urban hospital type, dementia, liver disease, renal disease, and cancer” [Ovbiagele and Nath, emphasis added]. — “CART [combination antiretroviral therapy] increases the risk of CCVD [cardio- and cerebro-vascular disease] . . . consistent with the hypothesis that atherosclerosis is a side-effect of CART” — D:A:D: Study Group, AIDS 18  1811-7. — “Toxicities of Antiretroviral Therapy” focuses on lipodystrophy and associated matters but mentions also osteoporosis and liver damage — Mallon, Cooper, & Carr, chapter 33 in Gary P. Wormser, AIDS and Other Manifestations of HIV Infection, 4th ed., Elsevier 2004). 4. “HIV-positive” black South Africans never treated with antiretroviral drugs experienced stroke at the same rate as HIV-negative controls — Mochan, Modi, & Modi, Stroke, 34 (2003) 10-15. A similar result was reported by Patel et al., “Ischemic stroke in young HIV-positive patients in Kwazulu-Natal, South Africa”, Neurology, 65 (2005) 759-761. 5. Cerebral vasculopathy among “HIV-positive” people was independent of viral load — Connor et al., Stroke, (2000) 2117-2126. Ovbiagele and Nath remark that “we were unable to evaluate use or duration of antiretroviral therapy”. Their findings therefore represent a lower bound to the risk of stroke brought about by antiretroviral drugs: If some of the “HIV-positives” who experienced strokes had been on HAART only for a short time, or not at all, then the increased overall incidence will have been owing more to those who had been on the “therapy” for the longest times; in other words, the actual risk of stroke from HAART is likely to be significantly greater than the average disclosed by this survey. But even that average represents a trend significant at the p < 0.0001 level, which is far more convincing than the misguided p < 0.05 criterion that is so often misapplied. Moreover, a Bayesian analysis would readily confirm the significance of the results, since the prior probability is already high, given all that’s known about toxicity of HAART. Ovbiagele and Nath exemplify the determined mainstream’s persistent labeling as “HIV-associated” what is actually HAART-associated. They suggest feebly, for example, that “the precise reasons for the rise in patients hospitalized for stroke with coexisting HIV infection are not immediately clear”; it might not be HAART but “evolving circumstances unique to HIV-infected patients”, whatever that might mean. “HIV infection can cause stroke via several mechanisms including HIV-stimulated endothelial activation (predisposing to accelerated atherosclerosis), opportunistic infections, neoplasia, HIV-induced cardiac disease, HIV-associated cerebral vasculopathy, HIV-induced systemic vasculitis, prothrombosis, and metabolic derangements. 4-8”. But an examination of those references 4-8 reveals that those “HIV”-associated things are actually HAART-associated, though in at least one case there was not even a comparison of HAART-treated and untreated patients (Brilla et al., Stroke, 30  811-813). Mainstream HIV/AIDS researchers suffer from HAART denialism. This entry was posted on 2011/01/26 at 4:05 pm	and is filed under antiretroviral drugs. Tagged: antiretroviral drugs cause stroke, HAART causes stroke. You can follow any responses to this entry through the RSS 2.0 feed. You can leave a response, or trackback from your own site. 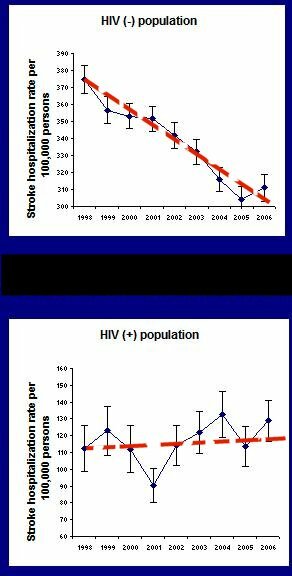 Those graphs seem to say that the rate of strokes in HIV+ people is about 100 per 100,000 but amongst HIV-negatives is about 300 per 100,000. This doesn’t seem to make sense to me. I hadn’t looked at the numbers, I’ll confess, just the trends to check what the article’s text said; and it said nothing about that numerical difference. Here’s my guess: the HIV+ population is younger than the population as a whole: “In unadjusted analysis, increasing age . . . . [was] associated with significantly lesser odds of comorbid HIV diagnosis”, and probability of stroke increases with age. The difference you point to should have been discussed in the article, and it isn’t. P.S. As so often, my unconscious delivers better ideas in the morning. I think the best way to view the discrepancy between ~100 and about ~300 is that they concern entirely different things. The ~300 is the (largely) natural incidence of all strokes, hemorrhagic and ischemic, which rises significantly with age and is relatively small at ages below the 60s or 70s. On the other hand, the ~100 concerns the incidence of ischemic strokes only, among people in their 40s or younger, the chief cause of the stroke being iatrogenic as a result of HAART. The Y axis title is the same for both graphs. Adding “ischemic” to the second graph would make things clearer for others, if possible to do. Thanks for the suggestion. I added some explanatory text, easier than re-drafting the graphs.